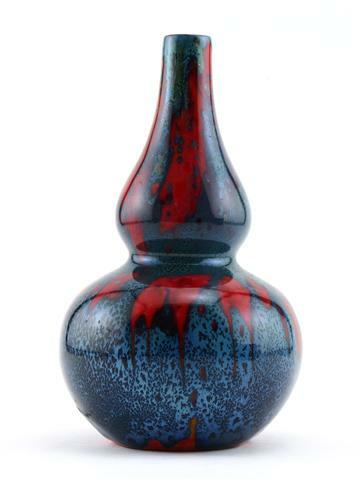 An unusual example of Doulton…..
Not quite what collectors expect to see when they think of Doulton’s famous Chang glaze but nevertheless this unusual vase is part of that range. Production of this branch of Chang ware was extremely limited and I have only seen 3 examples in total. Harry Nixon’s monogram to the base. 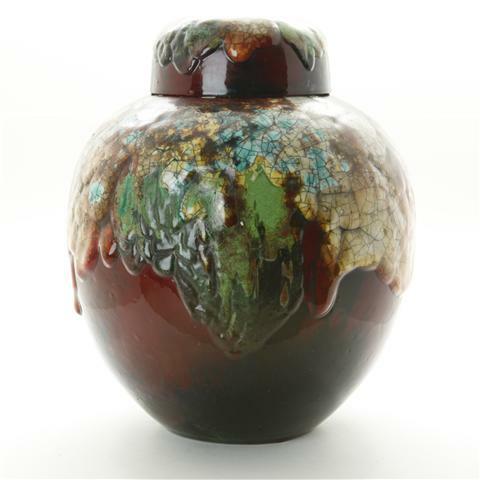 Charles Noke continued to experiment with glazes long after the departure of Cuthbert Bailey with whom he had perfected the Flambé glaze in the early 1900’s. And so in 1920 Sung was introduced, whereby painted decoration, colour and gilt are fused with the a flambé glaze. I am sure you will agree that these pieces are magnificent. However, it is in the flesh that these pieces must be enjoyed to full effect as in this slide. 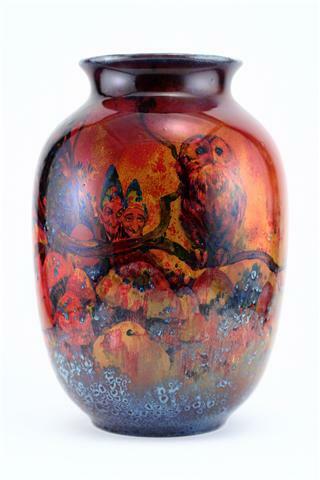 Vases, large and small were decorated with exotic birds, pixies in woodlands, fish in seascapes along with many other subjects. These pieces were painted principally by Harry Nixon, Arthur Eaton and Fred Moore. 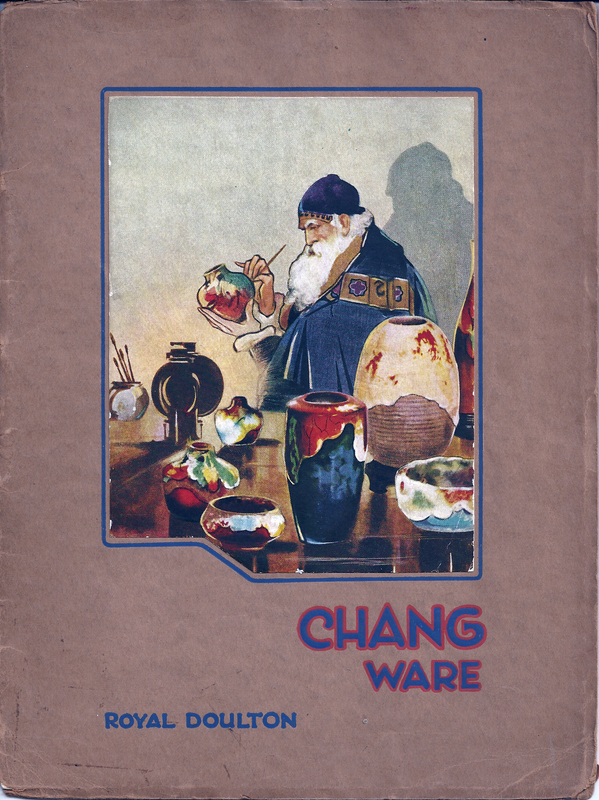 Sung glazes can be found on Buddhas, as can also be seen here in this advert from the 1920’s, a handful of suitable early figures from the HN range such as A Spook, as well as animals, in particular elephants, a favourite of Charles Noke can also be found. Orignial Sung advert ca. 1920. 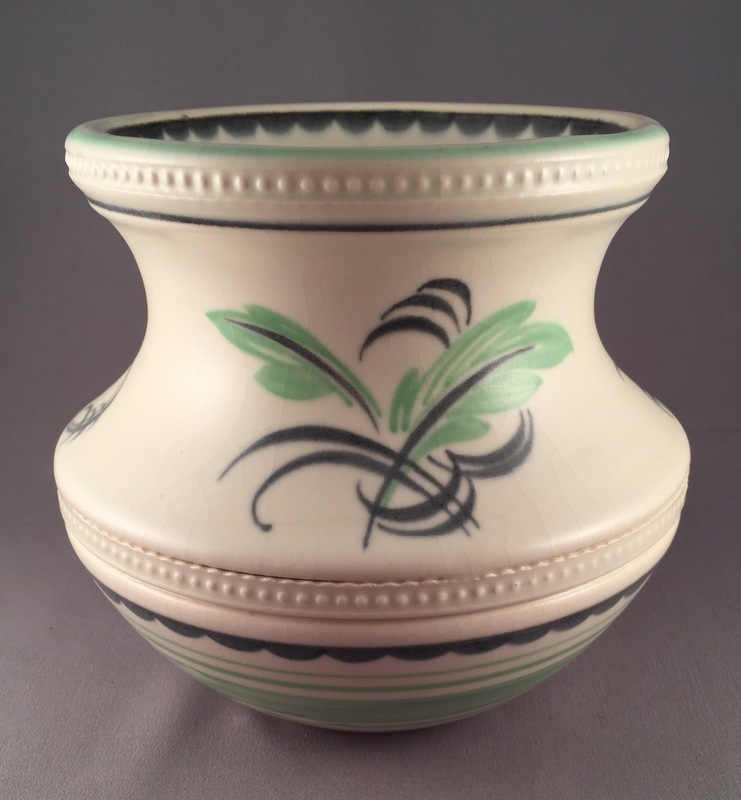 Another magnificent addition to the Burslem range in 1920 was the Chinese Jade glaze, imitating the ancient Chinese glazes of centuries before, by using a thick white glaze streaked with green. 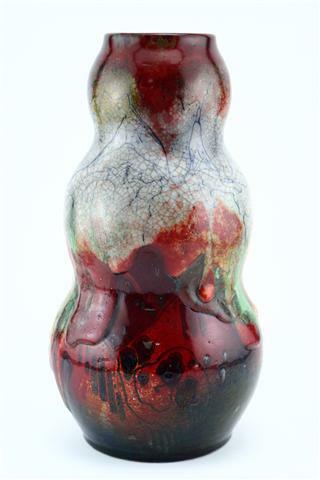 Pieces of Chinese Jade are exceptionally rare, due to the costliness of production, together with the high proportion of rejects due to the inherent difficulties in achieving this technique. 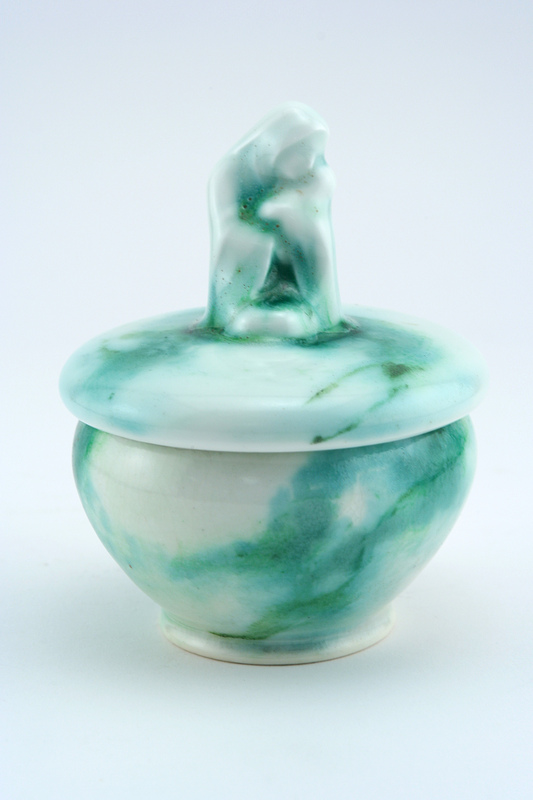 Chinese Jade lidded bowl with ‘Despair’ HN596 as the finial (the name of this figure is only a name given when the original figure book was published in 1978 as there is no record of its actual name). A variation of this ware exists whereby the green streaks are replaced by blue ones, and this extraordinarily rare glaze is aptly named Lapisware. A very rare Lapisware lamp base. Another glaze worthy of inclusion here is perhaps the most magnificent of all. 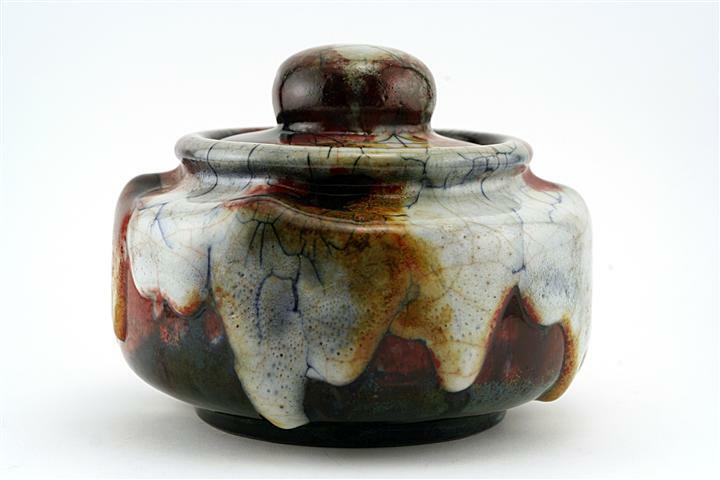 Chang ware was introduced in 1925 and involved a thick body upon which multi-coloured thick glazes were allowed to run and crackle – contrary to all usual pottery rules. The results you can see from this slide are breathtaking. Nothing like this glaze had been sen before even in ancient times, and it was greeted by worldwide acclaim. Chang pieces are usually found with the monogram for Harry Nixon on their bases together with Noke, for either Charles or Jack Noke, who succeeded his father as art director in the late 1930’s. The addition of Noke’s name signified the quality such work achieved. Chang ginger jar and cover. To finish here are a selection of other glaze pieces from the early 20th Century. Enjoy! 1900 Cuthert Bailey, a Chemist joined Doulton & Co.
1913 Famous visit to Burslem by King George and Queen Mary to Doulton at Nile St. Check out this link for a look at the first chapter in the 100 years of Doulton figures by me and published by Seaway China. 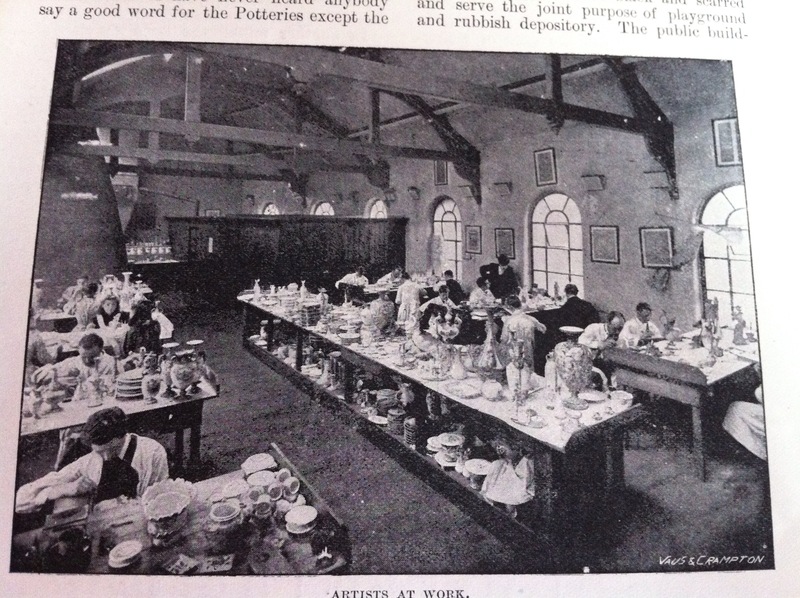 Few people in 1913 would have imagined that this article would be being written to celebrate the 100th anniversary of Royal Doulton’s HN Collection. 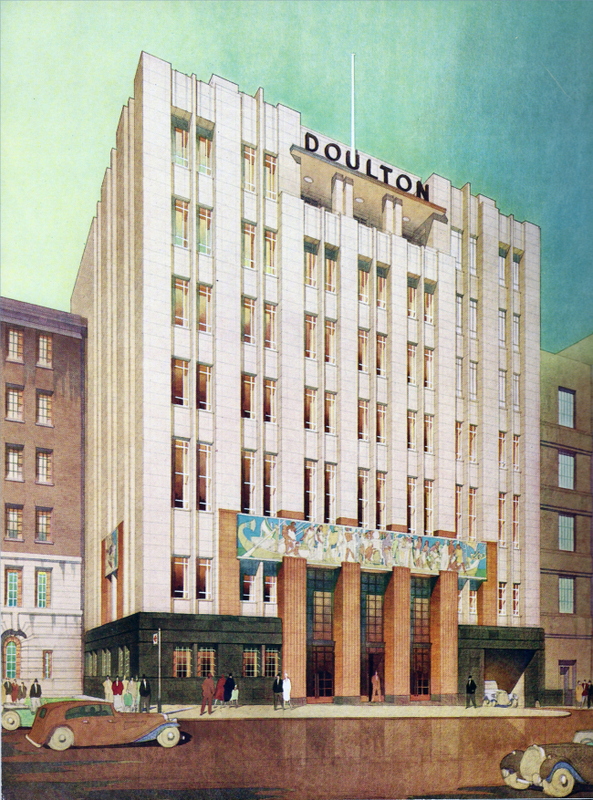 It was not after all Doulton’s first attempt at a introducing a figure range and many other famous factories had attempted and failed at this ambition. In 1893 at the World Columbian Exhibition in Chicago, a handful of figurative models by one of Doulton’s newest recruits Charles J. Noke were among their exhibits. 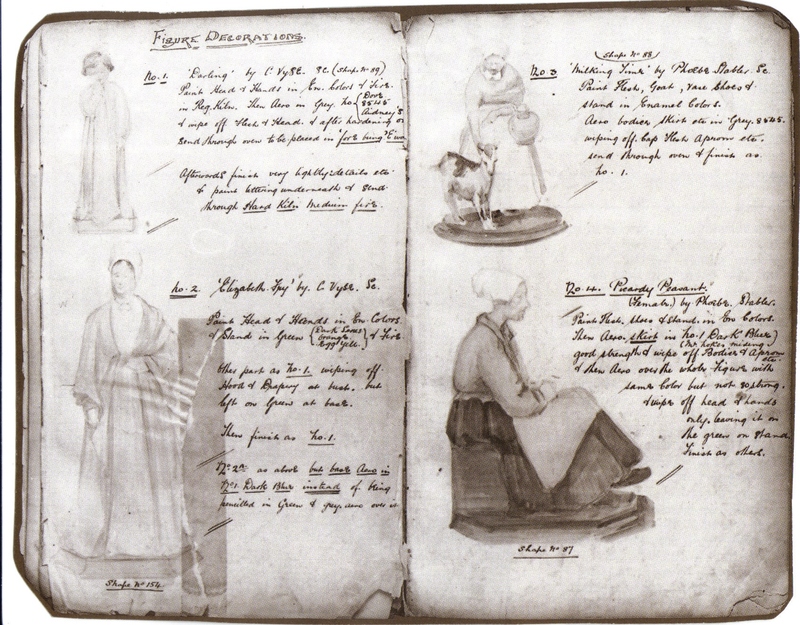 These minimally decorated figures, now commonly referred to as Vellum Figures, met with a mixed reception from the buying public and Noke’s ambition of reviving the once famous, Staffordshire figure production was put on hold as his attention was drawn away by other projects including the introduction of Kingsware, Rembrandtware, Holbeinware, Hyperionware, the famous flambé glazes and the introduction of Doulton’s Series Ware with patterns such as the popular Dickens series. The range of Vellum Figures was very much influenced by the products of the Worcester factory where Noke had worked for some sixteen years until leaving to join Doulton in Burslem in his early 30’s. He would later comment that he joined Doulton ‘not for the money but for the freedom’ as Henry Doulton famously allowed his artists free rein. 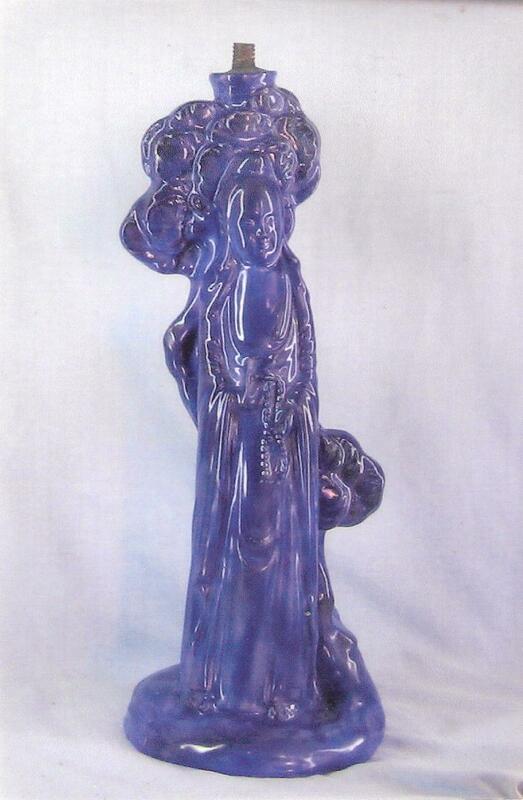 A timely visit to the Doulton Burslem factory in April 1913 by England’s then King George V and Queen Mary provided a re-newed impetus to Noke’s desire to launch a new range of figures. 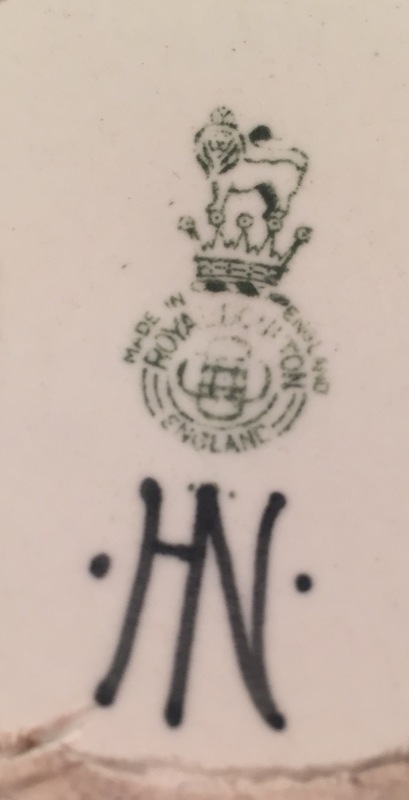 In the years preceding this visit Noke had been approaching a carefully selected group of artists to provide models for Royal Doulton to reproduce in ceramic. It is reported that the new range of figures was completed in late 1912 but the launch of the range was held back to coincide with the Royal visit, and what a good decision this proved to be as Queen Mary would become a fan of the range making many purchases over the coming decades. In Royal Doulton’s brochures from the 1920’s and 1930’s they even pin pointed the figures Her Majesty had purchased – it undoubtedly proved very useful to have the most famous lady in the land favouring their figures.